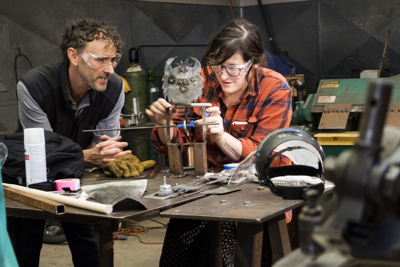 Art 183, Metal Fabrication, will again be offered as part of summer session 2018. Summer session 2018 courses and descriptions are now available at summer.ucsc.edu. In addition to offering high-demand courses, this summer features numerous experiential and service learning opportunities, including Kresge Garden Co-op and Grant Writing. New faculty-led summer abroad courses are availabe such as Law and Politics in Berlin and Prague, Printmaking in Tokyo, and Anthropological Food Study in Italy. Thirty departments are offering more than 250 on-campus courses, ranging from economics to ecosystems, and eukaryotic lab to the Entrepreneurship Academy. This year, there are 32 online courses, up from 20 last year. “We understand staying in Santa Cruz is not an option for all students. By expanding our online offerings, students can return home and work, but still make degree progress year round,” Parikh said. All students (in-state and out-of-state) pay the same summer tuition rate of $281 per credit. Financial aid is available for eligible students through state and federal loans, summer Pell, and the University Grant. On-campus housing is available at discounted rates. Enrollment opens to all students on May 1. Most courses are five weeks, with a few 8- and 10-week classes, such as engineering and physics. Check out all courses at summer.ucsc.edu or contact the Summer Session office for more information at 831–459–5373 or summer@ucsc.edu.